Dobkin's books are awesome. No history, no theory, and no b.s. Learn specific tips and techniques to double, triple, get 5x your response from any marketing campaign. More than 270 pages, not one wasted page. The value of this $15 book, incredible. 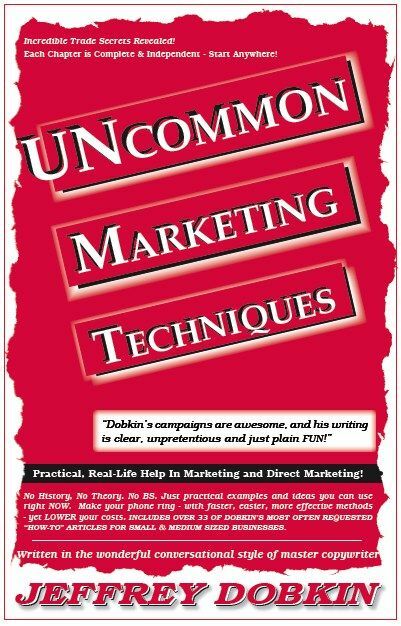 An awesome collection of over 33 of Jeffrey Dobkin's how-to articles on marketing and direct marketing. More than 250 pages of tightly focused tips and techniques to increase your response and make your phone ring. No history, no theory, and no b.s. The Biggest Mistake Every Firm Makes in Marketing and How To Correct It. Increase your Advertising Response 10 Times. Don't miss this book - at a special low price. You'd be foolish not to buy this book. This will be the best fifteen bucks you will ever spend to learn a lifetime of secrets from this master marketer's inside vision of successful marketing and direct marketing methods. Satisfaction guaranteed.